Good morning! Today at 2 Sisters we are challenging you to create a card/project with the theme of GETTIN' GIRLIE. We are being sponsored this week by Pattie's Creations. The image I am showcasing on my card this week is called Gymnast Pattieboop. The sketch that I used for my card this week is from the challenge at The Pixie Cottage. I created my card base using the colors mauve ice and vintage pink. I split the card diaganally using these two colors and backed them in brandywine. I then added tourmaline fine glitter from Martha Stewart Crafts to the brandywine cardstock which created the edging of my card. I then punched a strip of brandy wine cardstock using a starry night border punch from EK Success. I colored the image using crayola and prisma colored pencils and backed it in brandywine cardstock. I also backed the sentiment in the brandywine cardstock. I added more of the tourmaline fine glitter to the brandywine cardstock around the image and sentiment and to the outfit and hairpiece on the image. I punched 3 stars out of brandywine cardstock using a star punch from EK Success and added them to the left side of the image. I used 3 of the smaller stars from punching out the border and added them to the bottom left corner of the card. I then added more of the tourmaline glitter to all six stars. what a fab card...great image with her sparkly leotard!! I remember having a red sparkly leotard...I used to be a gymnast. Thanks for joining us at Paper sundaes this week. Oh my. look at that fabbie sparkle! Thanks for playing along at Paper Sundaes this week. Fabulous Mary!!! Love the glitter on here. Thanks for playing along at the Nook this week!! Super card, great use of the sketch! Very Sweet card! Love the star border. Thanks for joining us at the Pixie Cottage. 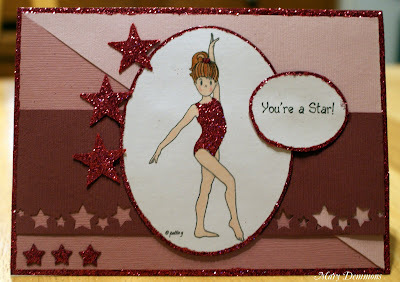 Fab card for the dancer in your life, love her glittery leotard! Thanks so much for joining in with the Creative Inspirations challenge this week.